The loss to Houston on Sunday all but ended talk of the Browns making a miracle run to the playoffs. The focus can return to the all-important coaching search. The last few days have been filled with news that could affect the search, or at least the timing of it. Oklahoma was chosen for the College Football Playoff, so even if Lincoln Riley is seriously considering the jump to the NFL, he’s not making it before the semifinal Dec. 29 against Alabama. Green Bay fired Mike McCarthy, putting a Super Bowl winner with deep ties to the Browns front office on the market immediately. Urban Meyer stepped down at Ohio State. All three have been mentioned in connection with the Browns job. 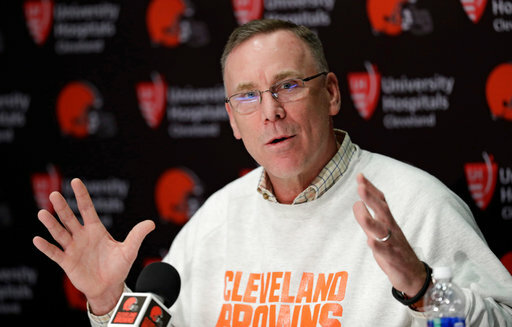 General manager John Dorsey is a creature of habit. Just look at his one-outfit-works-for-any-occasion wardrobe. So after spending four years as GM in Kansas City, it’s a natural assumption he’ll give a lot of consideration to a pair of respected coaches from that staff: assistant head coach/special teams coordinator Dave Toub and offensive coordinator Eric Bieniemy. They’ve been mentioned as potential candidates for any head coaching opening this offseason, so Dorsey wouldn’t be stepping out on a limb if he chose to interview both in the week after the season with the Chiefs expected to be on a playoff bye. Toub is a former strength coach, longtime special teams coordinator and worked in Philadelphia under John Harbaugh, who made the unusual leap from special teams coach to head coach. Toub just seems like Dorsey’s kind of guy. Bieniemy is a former player and Dorsey has raved about his ability to lead players, including the ones who need more leading than others. Bieniemy doesn’t call the plays but has learned under coach Andy Reid, considered one of the best in the business and the architect of the Chiefs offense that leads the league with 37 points a game. I’m not sure whom Dorsey favors between Toub and Bieniemy, but “Chiefs assistant” is a solid pick to be the next Browns coach. McCarthy makes too much sense not to be high on the leaderboard — assuming he’s interested in coaching right away and coming to Cleveland. Dorsey was on the search committee that picked McCarthy for the Packers in 2006. Two of Dorsey’s closest confidants, assistant GM Eliot Wolf and vice president of player personnel Alonzo Highsmith, were in Green Bay for McCarthy’s entire tenure until joining the Browns in January. The foursome won a Super Bowl together, which can’t be overstated. The only question I have about McCarthy is whether he’s willing to alter his offensive scheme to incorporate more of the spread concepts making their way from the college game. His system’s gotten “stale,” according to some, and he must prove he can adapt to the times. If he can follow Reid’s lead and diversify his scheme, perhaps by adding an innovative college coach to his staff, McCarthy can have the same renaissance Reid’s experienced in Kansas City after being fired in Philadelphia. If the interest is mutual, this hire could come together in a hurry. Dorsey spent the last two weekends scouting Oklahoma and Riley. That can’t be dismissed. Riley is young, successful and offensive-minded. 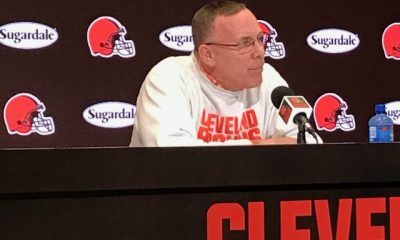 He coached Browns quarterback Baker Mayfield and they have a great relationship. But he’s never played or coached in the NFL and has been a head coach for only two years. Riley would have to want to make the jump to the NFL, and then Dorsey would have to be blown away. College coaches without a history in the NFL traditionally have failed. The NFL is a different world, with more politics, greater demands and much smaller talent differentials. I can’t rule him out, particularly with the Mayfield connection, but I don’t expect Riley to get the job. Let’s throw the other NFL coordinators into a pile. One hasn’t separated from the group, so it’s up to Dorsey to pick a favorite from his experience in the league. I’d put that guy behind the duo from the Chiefs, McCarthy and Riley. ** Meyer wouldn’t dare “retire” from Ohio State and take a job two hours north within two months. I think he’d be a disaster in the NFL, even if Buckeye Nation disagrees. ** If you’re not going to take a chance on Riley, how could you with Iowa State’s Matt Campbell? He has the Ohio roots that make fans swoon but not the success of Riley or an NFL background.